No steampunk outfit is complete without a period timepiece to accompany it! Sometimes the understated and subtle accent is the best one you can feature. These Bat Dress Pins are a casual and easy-to-wear accent that is perfect for effortlessly infusing gothic style into every look you might wear. Is your style of love filled with angel wings and harp music, or do you like to be just a little wicked? The Devil Heart Hair Screw displays a bright red enamel heart with silvery, pointed horns and a twining, forked tail. Our Large Steampunk Clock Gear Brooch is a gears and a watch gear were used to make this two inch steampunk brooch. It has a nickle silver brooch pin hand solder on the back. This pin will securely attach the brooch to your garment. This Gilded Paper Parasol is made of colorful SAA paper with a hand painted gold design with gold details on the handle and finial. Features a carved wooden handle and finial of sustainably grown wood. This Gilded Paper Hand Fan will keep you cool all summer and is great for year round decoration. It is made of colorful SAA paper with hand painted gold design and has a bamboo frame. This Highwayman Mardi Gras Mask is perfect for a dark avenger or a romantic evening. Beautiful black-on-black mask with iridescent sparkles. Black ribbon ties. Plastic. The Egyptian Princess Mask is is one of the most gorgeous masks we have ever offered. The black plastic mask has an Egyptian motif that is hand applied and then accented with an antique bronze finish. This Get a Grip Hair Slide is a Sinister Skeletal Bone Hand that features a large skeletal human hand made from pewter. 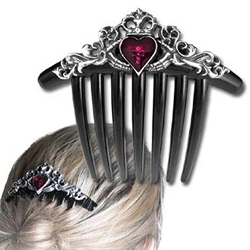 The Get a Grip Hair Slide adds a touch of gothic and vampiric style that can easily be added to any ladies appearance. Here is an easy way to have heavenly hair worthy of an angel from on high. Just slip this Heart of an Angel Hair Screw into place, and you will transform even a mundane hairstyle into something that is inspired and eye-catching. Our Pewter Steampunk Cog Brooch is a great Steampunk accessory. The brooch is 1 7/8 inches in diameter and is cast with lead free pewter. The picture show both front and back. As you can see there is a brooch pin on the back to securely attach the brooch to your garment. This Victoria's Steampunk Heart Brooch is a beautiful heart brooch with a lady's clockwork watch suspended in the center. Victoria's heart is 1 5/8 by 1 5/8 inches and the clockwork in the center is 5/8 inches round. The Memling Skull Dress Pins (Pack of 3) is a tiny, Hans Memling style skull as if taken from his Vanitas Triptych Sold in packs of three complete with end caps. This White Fantasy Mask is an exquisite mask made of all metal with delicate piercings and over 26 artificial diamonds on the face. White ribbon ties for easy fitting. The Skully Silver Hair Grip is a boneheaded with hollow-eyed simpleton that stares into the face of convention and confounds any curious onlooker. This small Skully Silver Hair Grip is a punky skull on the end of a standard gilt-coloured hair grip or bobby pin. The Skully Black Hair Grip is a boneheaded with hollow-eyed simpleton that stares into the face of convention and confounds any curious onlooker. This small Skully Black Grip is a punky skull on the end of a standard gilt-coloured hair grip or bobby pin. The Serpants Eye Hair Slide is a beautifully detailed hair piece made from fine English pewter. Three Celtic serpents infused with sacred healing powers encircle the sanguine red abalone snake-eye to protect the wearer against the evil eye. There comes a time when you just have to stop and screw the hair, literally! With its corkscrew design, this Smoke Dragon Hair Screw is an elegant accessory to weave into your locks to add something mysterious and mystical to your look.